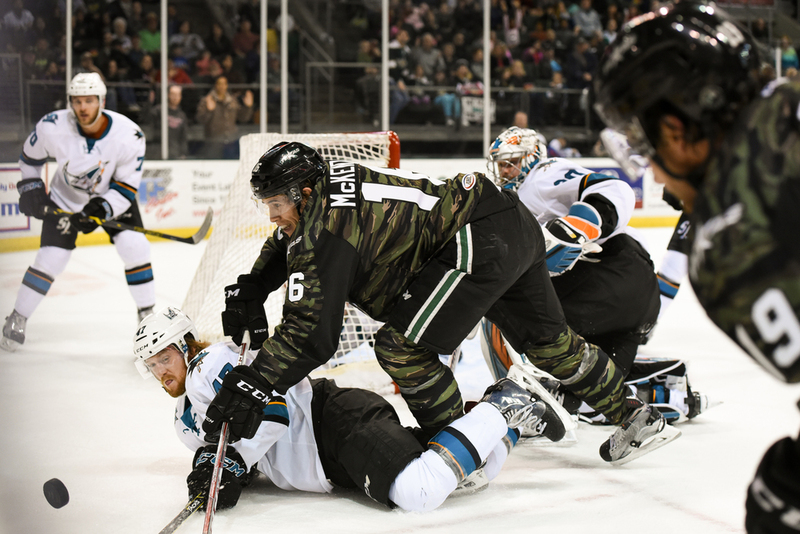 The Texas Stars had a pair of games this weekend against the San Jose Barracuda. 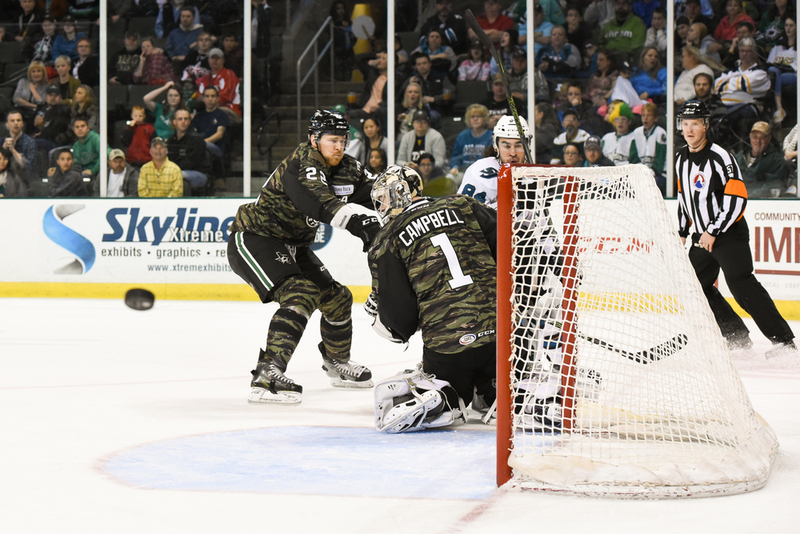 It was Military Appreciation weekend and the Stars were sporting tiger stripe camo jerseys. The special jerseys were auctioned off for charity. 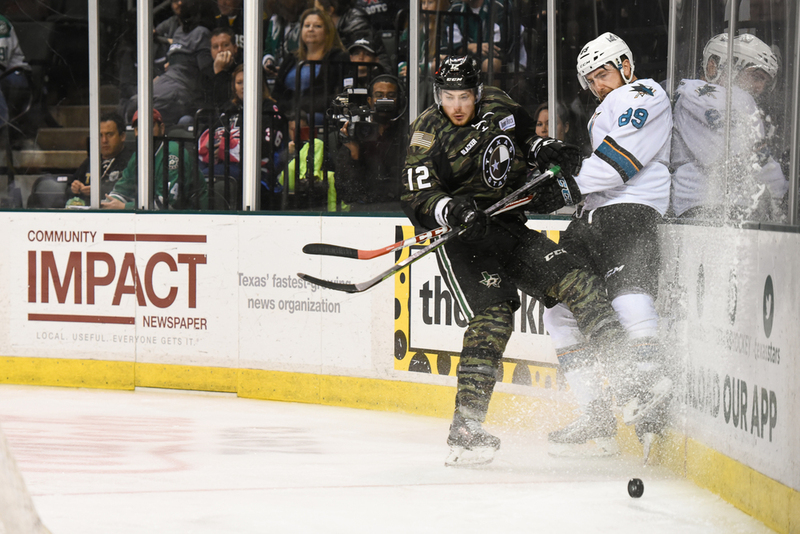 It was an exciting weekend all around as the Stars managed to clinch a spot in the Calder Cup playoffs. There weren't many high points of the Friday game for the Stars. The Barracuda shut the Stars out with a 3-0 win. It was a tough game to watch as the Stars failed to get a single puck in the net. The first shot above is an impressive 2 for 1 hit by Niklas Hansson to tie up two opponents at once. The second shot is an ice spray that got me through the lens hole in the glass as Jason Dickinson grabbed the puck in the corner with an opponent right on the heels of his skates. The third shot is a solid check by Jesse Blacker on a race to the puck in the corner behind the Stars' net. 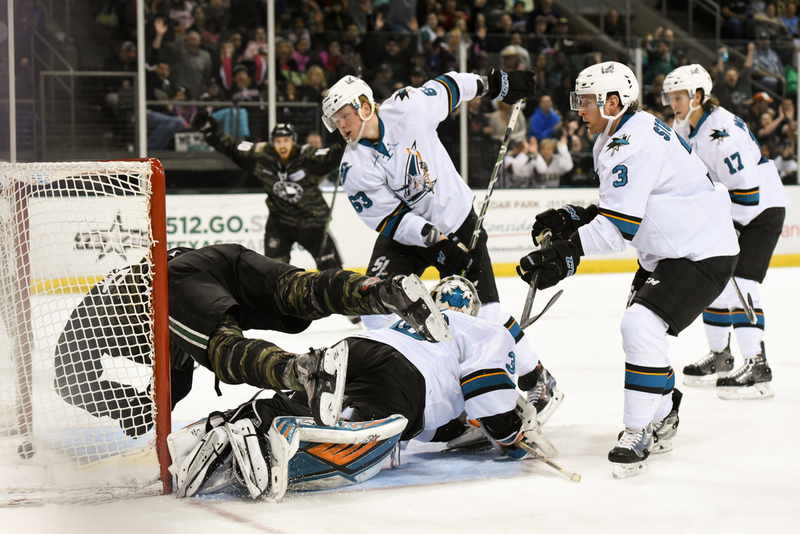 Saturday's game didn't look so good for the Stars as the Barracuda struck first and at one point had a 3 goal lead on the Stars. Maxime Lagace started in net for the Stars and was replaced by Jack Campbell after the 3rd goal. Two more shots would get by Campbell before the Stars sprang to life about mid game and took control of the game. The Stars turned a 3 goal deficit into a 3 goal lead for a 8-5 game win and a clinched playoff spot. The first shot above is Jason Dickinson getting the puck and himself into the Barracuda net. The second shot is Curtis McKenzie barreling over his opponent in a fierce battle for the puck around the net. The third shot is a deflected puck from a shot on Campbell's net heading straight for this photographer's position. No lenses were harmed.